In keeping with the spirit of National Chicken Month, this week’s featured recipe can be prepared with either light or dark meat chicken. As with most poultry recipes, the part of the chicken you chose to prepare depends on personal preference. Dark meat is fattier and sometimes gamier in flavor than white meat because it comes from a more active part of the bird (wings, thighs, and drumsticks) and is a different type of muscle than its white meat counterparts including the breast. Running low on your supply of chicken? Check out the full list of Passanante’s Home Food Service’s poultry products. This next recipe just may become a family favorite as we welcome fall and cooler weather in the coming weeks. 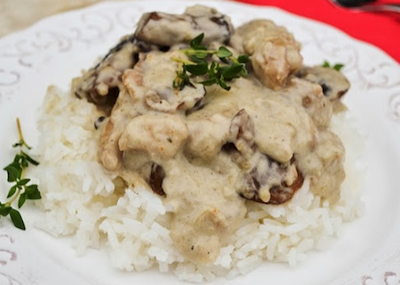 Boasting gooey Parmesan and Asiago cheeses as well as tons of garlic, Mushroom Asiago Chicken is the perfect answer to any savory craving. Combine salt, pepper and flour in a bowl and coat each strip of chicken in the dry mixture. Want to browse our other chicken recipes? Click here! This entry was posted in Poultry, Recipes and tagged Chicken Recipe, Grade A Poultry, Passanante's Home Food Service, Recipe by Passanante's Home Food Service. Bookmark the permalink.